I am a little late in getting this post out as National Walking Day, sponsored by the American Heart Association, was held on April 3rd. But better late than never. 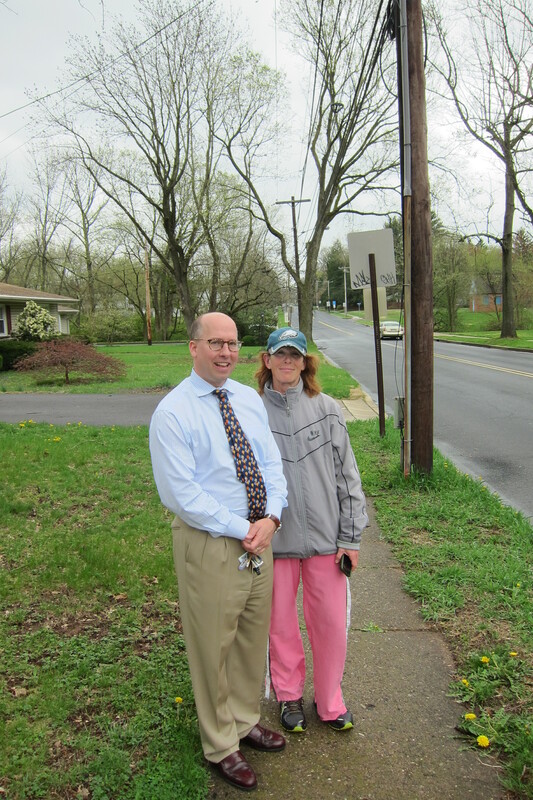 Becky is a Lansdale resident that walks in Lansdale. A lot. If you’ve driven more than a few times on Hancock Road, Route 63, aka Main Street, Broad Street or North Wales Road, you have most certainly seen Becky. She usually wears her Eagles hat and she walks rain or shine. When the mercury dips and when the mercury soars she is out there (she did however say that during extremes in weather, she does sometimes stay at home). She began walking her route in 1991 when her doctor told her that she needed to get some exercise for a medical condition. She walks seven days a week. Her route is always the same and always in the same direction– counterclockwise. One lap is four miles, and she typically does five laps for a total of twenty miles a day or one hundred forty miles a week. She changed her direction once about five or six years ago, but she didn’t like walking with traffic, so she went back to walking counterclockwise. Becky and her husband, Bob, with whom she was walking today. Walking the same route day after day, I asked her what changes she has seen in the Borough in her almost quarter of a century walking around the East end of town. She told me that traffic has increased, but otherwise people are the same. Some people honk their horns and say hello, and teenagers sometimes yell obscenities– as is their tendency. She told me that when she first started walking, one lap took her 45 minutes, but with age, a lap now takes an hour. I also asked her about crime and whether or not she ever had any problems while walking. “Nope”, she replied which is good to hear as the mayor. She and I chatted a little about Lansdale and the fact she has lived here most of her life– she was born in the old North Penn Hospital– and other than a stint in North Wales she likes the town, but wishes there were more shops on Main Street like there used to be when she was a child in the sixties. We wrapped up our delightful conversation as I was not dressed for walking any distance in my loafers. And looking at my little paunch in the photo below, I could probably stand to walk a little bit more myself, but I think I would have to undergo some training to keep up with Becky, Lansdale’s Walking Ambassador.